But Congress could do several things which would quickly eliminate the territory’s budgetary problems. Part 14 in this series suggested the simplest and most effective step would be to treat the USVI and other territories like a state for Medicare and Medicaid reimbursements and to update the payment schedule for the USVI. But there are other things that Congress could potentially do that could completely eliminate the USVI deficit without costing the federal government a penny. Cruzan and Diageo, the two USVI distilleries, sent about 17.5 million proof gallons of rum into the United States in 2016, where the federal government taxed it at $13.50 per proof gallon. A proof gallon is 50 percent alcohol, or 100 proof. The federal government gave $13.25 per gallon back to the territory, remitting $231.5 million that year. But only around $20 million actually supported the government’s budget that year, according to Gov. Kenneth Mapp’s FY 2018 budget’s historical data. Where did the rest go? Mapp’s budget submittal for FY 2016 year indicates about $86.28 million went to pay interest and principal on more than $1.3 billion in debt secured by those revenues. The territory is paying for projects at Diageo and Cruzan, financed with special bonds secured by the federal rum revenues. Those ate up another $23.2 million in principal and interest, according to the terms spelled out in the loan documents. Nearly all the remainder – a little more than $100 million – went as a direct cash payment to Diageo and to Cruzan’s parent company Beam Suntory. Counting the government-financed construction loans for the distilleries, the territory gave those two highly profitable multinational liquor conglomerates almost $125 million in 2016 alone. Do those distilleries need massive subsidies to stay in business? Diageo made roughly $4.6 billion – that’s billion with a “b” – in net profit in 2016, according to its earnings statements. That is slightly more than auto manufacturing giant Ford made that year. Beam Suntory’s alcohol division made 88.3 billion yen in net operating income, or about $800 million in 2016. 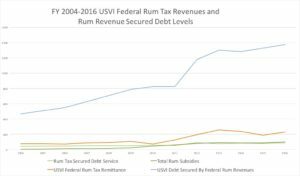 The territory has long given cash subsidies to the rum companies, but since 2010, those have been increased repeatedly, in a bidding war between Puerto Rico and the USVI. Up to 46 percent can be given as direct cash subsidies to Beam Suntory and Diageo under the terms of the Diageo contract with the territory and V.I. legislation approved in 2014 in response to similar legislation in Puerto Rico. 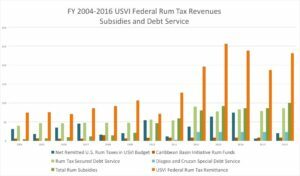 The cash subsidies are curiously absent from USVI budget documents, but can be estimated based on the statutory and contractual subsidy formulas along with data on total federal taxes on V.I. 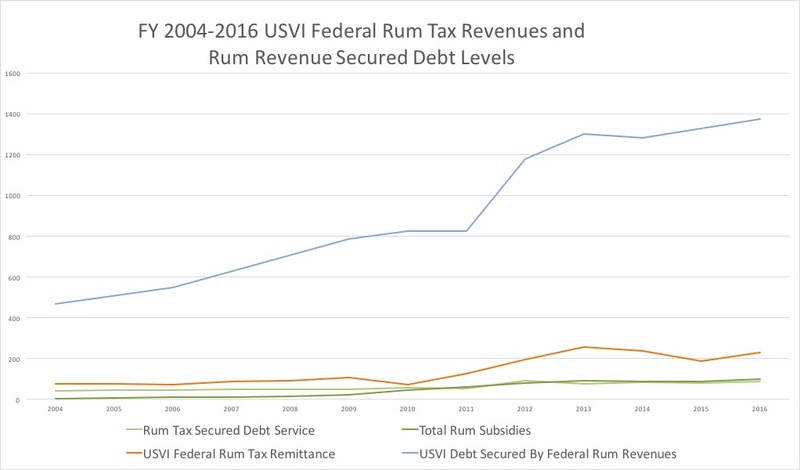 rum production, amounts spent on USVI debt service and amounts included in the USVI budget. The contractual and statutory formulas are different for each company, but ultimately amount to roughly 46 percent of remitted federal taxes, plus another $23 million per year to pay off special bonds secured by those taxes that paid for the Diageo factory’s construction and major renovations at Cruzan Rum. These companies also have nearly complete forgiveness on V.I. taxes, including corporate income and dividend taxes which companies based in the territory pay in lieu of paying federal taxes. They get a 90 percent exemption on corporate income tax, paying at most 3.5 percent. 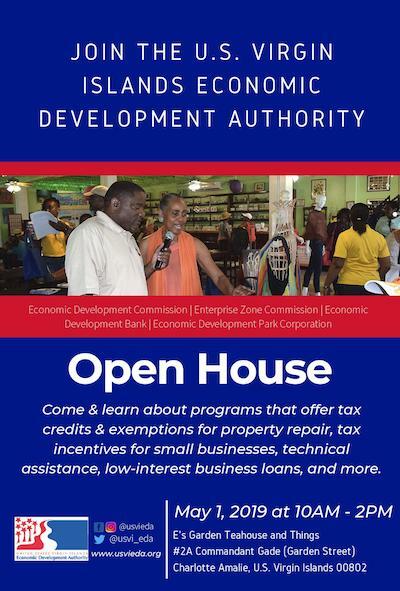 Diageo dividends are 90 percent tax exempt in general, but 100 percent tax exempt for dividends it pays with the USVI’s annual cash subsidies. They are completely exempt from V.I. real property, gross receipts and excise taxes, and 99 percent exempt from customs duties. Its 40-plus V.I. employees do pay V.I. personal income tax at the same rates they would pay to the U.S. Treasury if they were in a state. Puerto Rico gives similarly generous subsidies. Subsidies and tax breaks were always generous in both territories. But they shot up after 2009, when deJongh offered Diageo increased subsidies to woo it to the territory. The rum companies play the two territories against each other, forcing them to bid to the bottom against each other. 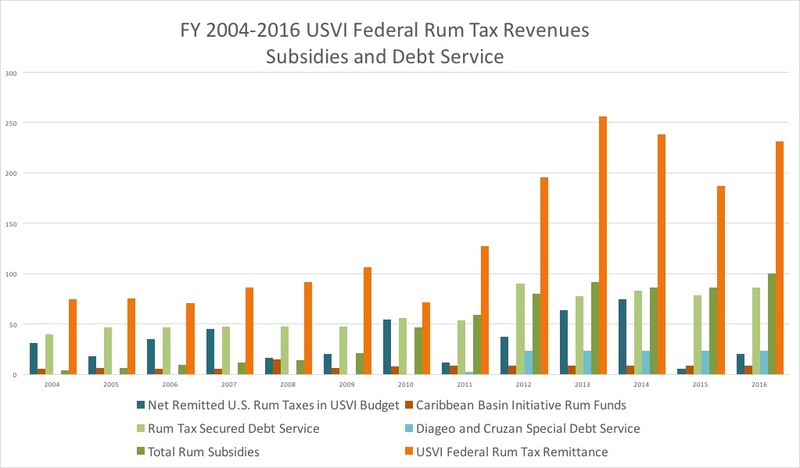 Since 2009, there has been a worsening spiral of increased subsidies as both territories fought to prevent a massive flow of bulk rum sales to whichever territory gave more. The Center for Investigative Journalism, an independent Puerto Rican investigative journalism organization, reported in February that Puerto Rico has given roughly $80 million more per year to rum producers since the Diageo deal, just to try to match the increased USVI subsidies. That is just the increase in subsidies. Overall, Puerto Rico has given a total of $554.8 million in federal excise tax revenue to three rum producing companies in Puerto Rico, mostly to Bacardi, over that time period, giving $178 million in 2016 alone, according to the Center for Investigative Journalism. 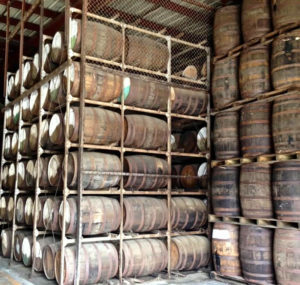 Barrels of rum aging in the Cruzan warehouse represent future revenues for the territory. “The amendment’s done to the Internal Revenue Code under the Luis Fortuño administration increased the rebates rum producers receive from a maximum of 10 percent to 46 percent, which has undermined the General Fund that used to receive that money and used it for economic development projects,” the investigative journalist group reported. The V.I. Legislature reluctantly responded to Puerto Rico’s increases by increasing subsidies to Cruzan Rum in 2012 and yet again in 2014, bringing Cruzan subsidies up to 46 percent. Diageo subsidies were already contractually at about that level, subject to a complicated set of formulas. Cruzan Rum President Gary Nelthropp told V.I. senators in 2014 that bulk rum sales had dropped off dramatically, as purchasers flocked to buy slightly cheaper Puerto Rican rum. Sen. Nereida Rivera-O’Reilly (D-STX), who has been highly critical of the Diageo subsidy increases, voted for the increases. “We are going to vote for this because we have to protect our cover-over revenues, because they provide close to one-third of our budget now,” O’Reilly said in 2014. “People have to understand how serious this is,” she added. Then-Sen. Louis Patrick Hill (D-STT) painted a similarly stark picture, saying if the territory did not match Puerto Rico “we are essentially saying that 70 percent of their business will go elsewhere, whether Puerto Rico or wherever. 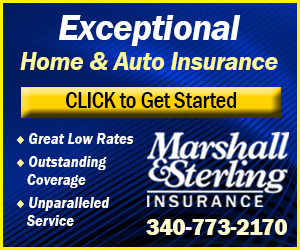 And we will have the remaining 30 percent and see how long that lasts,” he added. Those market forces make it very difficult for either the USVI or Puerto Rico to unilaterally change subsidy levels. Without rum companies taking any action at all, bulk rum sales will flow away from whichever one cuts subsidies first. The rum companies are not villains here. They have a legal fiduciary duty to maximize profits for their investors. The V.I. and Puerto Rico governments have an obligation to try to maximize revenues within their territories. The culprit is the system created by Congress that encouraged a spiraling bidding war between the territories. 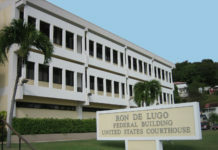 The territory’s contract with Diageo also forbids the USVI from reducing subsidies. Gov. John deJongh Jr. got a lot of criticism for making a generous deal with Diageo to bring a distillery to the territory. DeJongh has always responded that the new factory was a net benefit, bringing in more tax revenue than the territory would have had otherwise. Which is true. The governor does not control the rules of the game. Within those rules, attracting the factory was, relatively speaking, a win. The territory does have more total rum revenue than before. 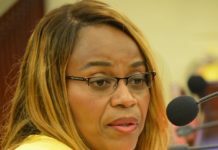 DeJongh says that increase allowed the territory to avoid massive layoffs of teachers and police officers when government revenues declined after the 2008 worldwide recession and 2012 closure of the Hovensa refinery on St. Croix. Which is also true. The territory borrowed more than half a billion dollars, using federal rum taxes as security, during that time frame. DeJongh also firmly believes capping subsidies could harm the territory by taking away a tool the territory needs to attract businesses to its shores. The USVI has to be concerned with being able to compete not just with Puerto Rico but special tax jurisdictions in the states. But both Puerto Rico and the USVI lose when they compete to see who can give away more. And states may give breaks on state taxes, but only the territories can also give what practically amount to large exemptions on federal taxes, taxed by the territories through their mirror tax systems. Gifts to extremely profitable multinational liquor conglomerates are not the best use of federal tax dollars. Only Congress can change this, by capping the amount of federal excise tax dollars that can be turned over to rum companies. 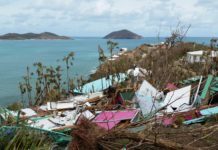 Successive governors and delegates to Congress have been hesitant to endorse this, and opposed it when Puerto Rico’s congressional representative proposed legislation to do it. Only Congress can change the tax laws regarding subsidies to rum distillers in a way that removes any incentive for either territory to try to undercut the other. Hoping for coherent, thoughtful and helpful action soon from the current Congress may be optimistic. But Congress is where the change needs to happen. In 2009, Puerto Rico Resident Commissioner Pedro Pierluisi sponsored a bill in the House of Representatives to cap how much of the federal tax revenue could be remitted to the rum companies. In 2012, Sen. Robert Menéndez (D-NJ) proposed a similar measure in the U.S. Senate. Both bills failed, with vigorous opposition from deJongh and from the rum industry. Donna Christensen, the V.I. delegate to Congress at the time, said she would be willing to consider some such cap on future use of the funds, but opposed any measure to impose the restraint retroactively, because the funds have already been committed and bonds already sold. Asked recently whether she would support legislation capping subsidies to rum producers, the current V.I. representative in Congress: Delegate Stacey Plaskett (D-VI) said she would expect the local V.I. 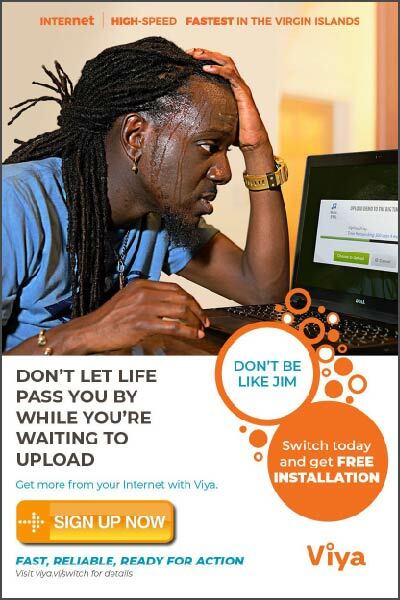 government to make the request because it affected local V.I. revenues and policies. But the V.I. government’s contract with Diageo not only forbids the territory from asking for a change, it requires it to lobby against any reduction in subsides. The contract says the V.I. government “agrees to use reasonable efforts to strenuously oppose any proposed legislation, initiative, act, event, plan or proposal which would otherwise have the effect of voiding or reducing” and “shall take all legally appropriate steps to defend,” the subsidies. But the penalty for breach of contract is that it would allow Diageo to produce less rum in the territory. On the one hand, Diageo is only required to produce 1.5 million gallons per year, while it actually produces about 10 million gallons, so it can cut production anyway. On the other hand, cutting production at its own government-financed distillery would seem to be cutting off its own nose to spite its face. But arithmetic suggests this may be an empty threat and that the competition is really only between the USVI and Puerto Rico. After all, the USVI already gives effectively total tax exemptions to local rum companies. It can do this because it gets upwards of $200 million per year in federal alcohol excise taxes remitted back to it. Puerto Rico does much the same. But Guatemala does not get those excise tax revenues. Unless arithmetic works differently there, how can Guatemala – or any country – provide the water, roads, port access and other infrastructure needed to build a massive factory, while getting zero tax dollars? And why would Guatemala do that? For the employment? The last time Diageo officials testified to the Legislature, the company had 42 V.I. employees. Each supermarket in the territory has as many or more employees. Some restaurants have more employees. By the same token, how much difference can labor costs really make at a distillery that uses 42 employees to make more than 10 million gallons of rum every year? 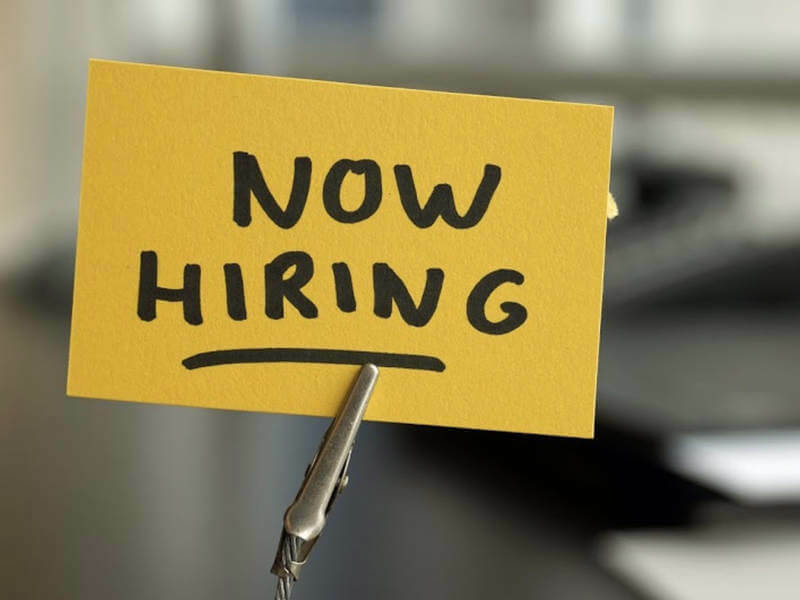 Are U.S. employees getting millions of dollars apiece? As long as distilleries in the territories and other countries must pay excise taxes on all rum sold in the U.S. and territorial distilleries do not pay V.I. or Puerto Rico taxes at all, it is difficult to see how any other nations could realistically lure distilleries away with a deal that provides a better return. Is Guatemala going to buy Diageo a factory to replace the brand new one it got free of charge on St. Croix? How will it pay for that, if it is also exempting Diageo from all taxes? Regardless, in a Congress that rarely thinks about the territories and is currently led by a GOP that favors cutting corporate taxes, without strong lobbying from both the USVI and Puerto Rico the odds may be against change anytime soon. And there is no sign either territory is going to start lobbying. There is another pot of rum tax money the territory could get – as much as $20 million more a year that it is arguably already due under existing law. The U.S. Virgin Islands may have been shortchanged by as much as $100 million in federal excise tax revenues, Plaskett said in February. Plaskett’s office uncovered the possibility that V.I. cover over revenues since the Diageo agreement may not have been properly adjusted to reflect the new production of rum in the Virgin Islands, denying the territory tens of millions of dollars over time. 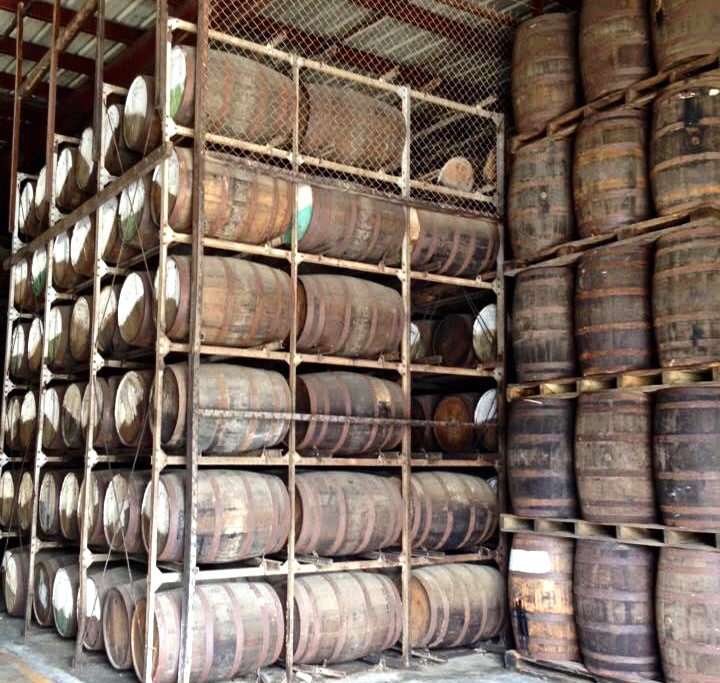 Puerto Rico’s rum production has declined in proportion to the USVI, since the Diageo distillery came online. “But they (Treasury) continually put Puerto Rico at 88 percent or above and the Virgin Islands at the floor,” Plaskett said in February. 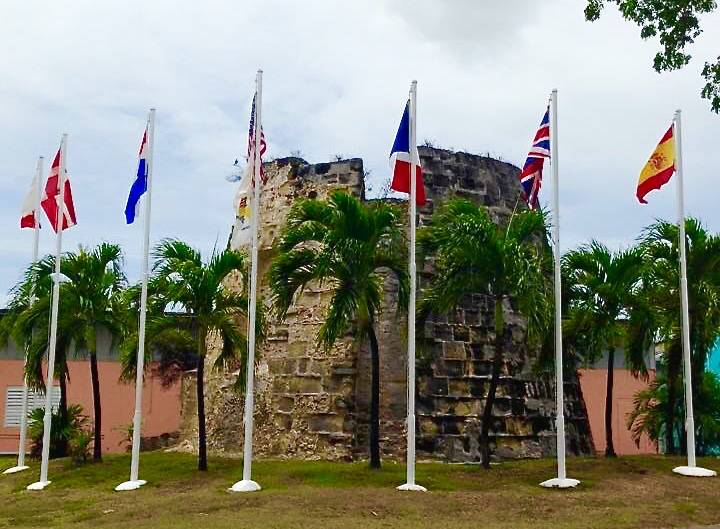 Plaskett recently confirmed this was still the case, and said that the proportion has not been updated since the 1980s – long before Diageo came to the USVI. Under current law, the U.S. Treasury is supposed to periodically revise the proportion, based on the two territory’s proportionate rum production. 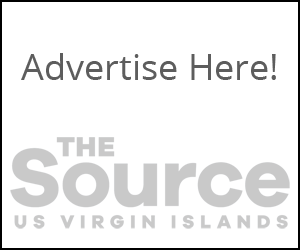 “The rum producers in the USVI are very happy to support us in that claim,” Plaskett said recently. But she said it would be up to the government of the Virgin Islands to press for that change, because it is the V.I. government that is actually due the money. She said she has reached out to the administration of Gov. Kenneth Mapp but has not received any response or any indication they are seeking the change. Mapp recently met with federal officials in Washington D.C., and discussed rum tax issues, but statements from Government House make no mention of the Caribbean Basin Initiative funds. Emails to Government House Spokesman Sam Topp for comment have not been returned to date. The V.I. Budget Crisis, Part 14: Medicaid and Medicare, How Did We Get Here, How Do We Get Out? Doe the VI legislature think they report to the governor? Do they not have the power and authority to act in opposition to the Governor, and override a veto if necessary? They should be able to act on their own on any issue that comes before them. They are supposed to do more that just draw their inflated paychecks.